The austerity measures passed by the Greek parliament have sparked outrage among the population. Demonstrations and strikes take place regularly, the situation is tense. 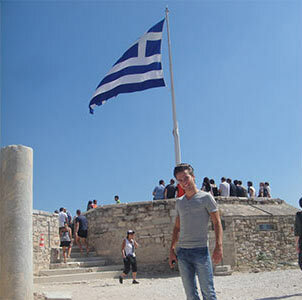 However, this did not put ISM student Efthimios Tsoupis off spending a semester in Athens. "I was actually born in Greece and after undertaking a one-month work placement in Athens it was my aim to return and live there for a longer period of time," says the 21-year-old. That is the reason why he decided to spend a semester abroad at the Athens University of Economics and Business. "I took five subjects, including a Greek language course. All the lessons were conducted in English," explains Efthimios, who is studying for a B.A. in International Management at ISM Dortmund. During his time in Greece, he had plenty of opportunities to meet and make friends with other Erasmus students – from Germany, Spain, France, Sweden and Belgium.